We are one of the trusted organizations in this business that are into offering Tea Vending Machine to our precious customers. 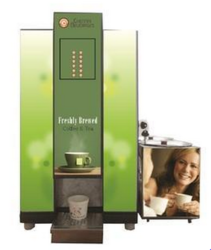 These Tea Vending Machines are manufactured in accordance with set industry quality standards and norms. Besides, these products are thoroughly tested for quality before shipping. Our firm offers a varied range of Filter Coffee Vending Machine. Professionals develop this product as per worldwide industry standards. We offer this product at nominal costs.